Plum facts, an information sheet for kids cooking activities. 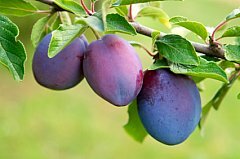 Plum facts and general information about plums. Plums grow on trees like apples or peaches. There are various different varieties of plums and they come in colors from yellow, orange, red or purple. Avoid plums with cracks or soft spots. They should give slightly when pressed. If ripe store in fridge. To ripen, store at room temperature. Use in sauces, make jam, or dry fruit. Eat as is, chop in fruit salads, or fruit desserts. Plums are a great source of Vitamin A, Vitamin K and Vitamin C. They also aid in digestion. Chop plums in blender and add sugar. Place in saucepan and bring to a boil. Boil 5 minutes. Add ingredients in the blender and blend until smooth.